Patients undergoing elective inpatient surgery for four common elective procedures (hip and knee replacement, varicose vein surgery and groin hernia surgery) funded by the English NHS are asked to complete questionnaires before and after their operations to assess improvement in health as perceived by the patients themselves. Extended analyses of the latest finalised data are published three times a year as 'special topics'. The latest, Rates of Attrition 2013-14, Patient Reported Outcome Measures (PROMs) in England, was published on 12 May 2016. For the coverage period 1 April 2015 to 31 March 2016. 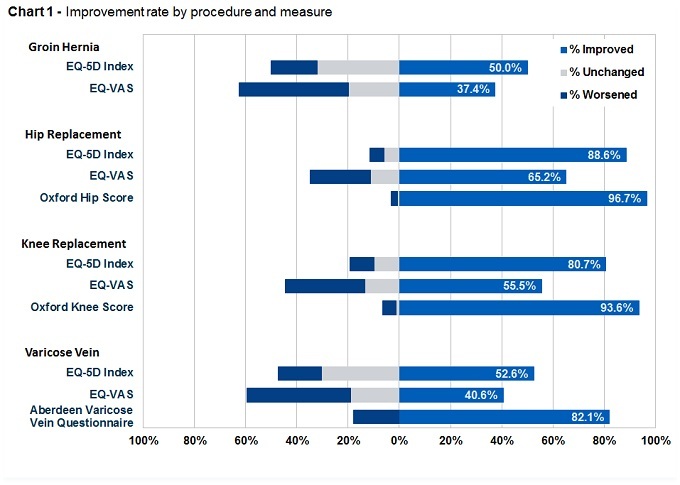 There have been 263,003 PROMs-eligible procedures carried out in hospitals1 and 196,049 pre-operative questionnaires returned so far, a headline participation rate of 74.5 per cent (75.6 per cent for 2014-15). For the 196,049 pre-operative questionnaires returned, 149,401 post-operative questionnaires were sent out2, of which 92,168 have been returned so far - a return rate of 61.7 per cent3 (73.0 per cent for 2014-15). An 'eligible procedure' is counted for each episode in HES in the period in question which has been clinically coded with relevant hip, knee, varicose vein or groin hernia OPCS procedure codes which make it suitable for inclusion in PROMs. Some patients may have undergone more than one PROMs procedure in a single eligible episode, hence there will be more procedures than episodes: this is the case for 69 of the 263,003 procedures. Not every pre-operative questionnaire will have a post-operative questionnaire sent out, for various reasons including the cancellation of an operation or the death of the patient. This will be an underestimate of the true rate due to the time delay in returning post-operative questionnaires.